I don't normally get too many items associated with baseball cards for my birthday. I have to rely on Marie for that, and she always know just what to get me. This year Marie bought me a card and as a fill-in my boyfriend bought me bunch of loose packs of Topps Series 2. Both were a lot of fun. Here's the card Marie got me. ... I'm still working through the packs of Topps, savoring the feeling of ripping them open. 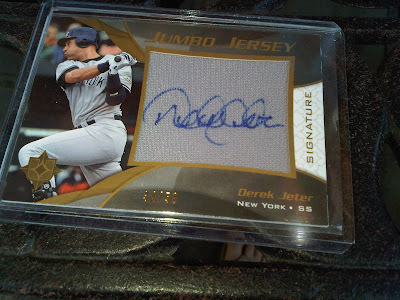 I have five Jeter autos, three were were given to me as gifts from Marie, one I pulled and the fifth we got out of a case of Masterpieces. Marie has done wonders for my Jeter collection. I really like that card design. You're one lucky guy. Oops... I stand corrected. You're one lucky woman! I wish my friends would give me nice cards like that.